Over the years friends of Stage 5 have bestowed upon us some beautiful items. We are so extremely humbled that so many folks care so much about Stage 5. 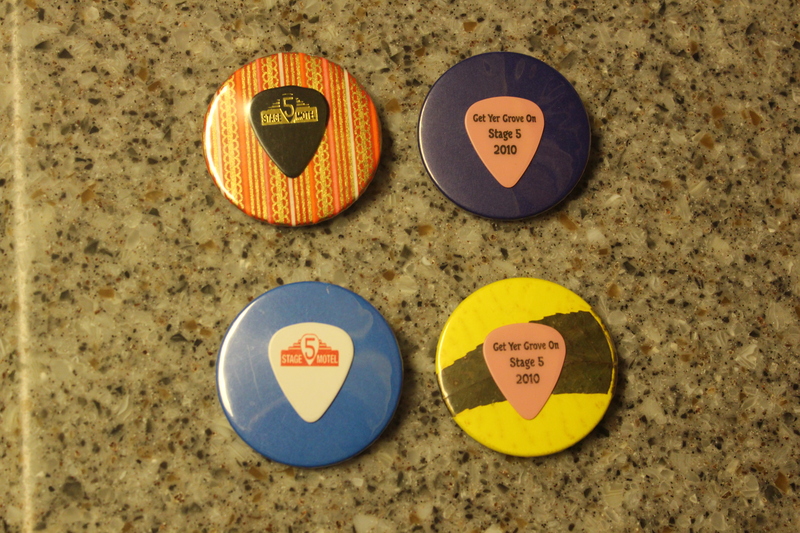 We would like to share photographs of some of these items here with you plus we have a lot of fun with our logos and slogans .. you will fine some of the “swag” from over the years here too. 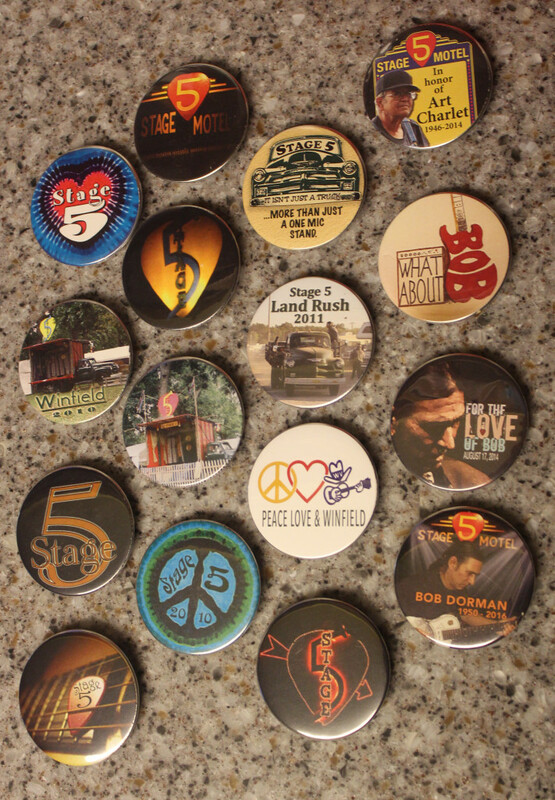 A sample of buttons made by Jana Dale for the Stage 5 Crew. 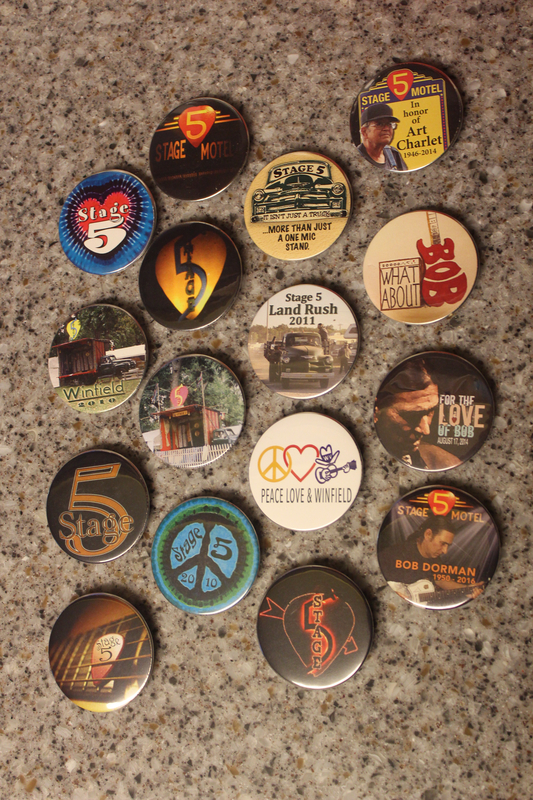 Jana has blessed us with lots of buttons over the years. 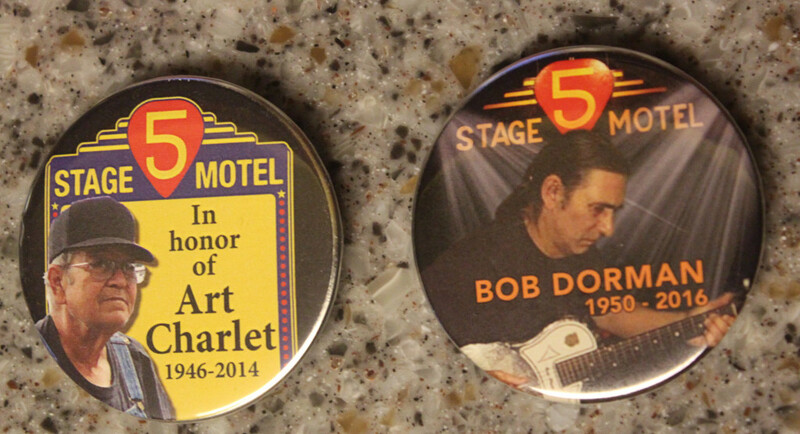 These buttons are a sample of the crew pick buttons made by Maryann Lippincott. 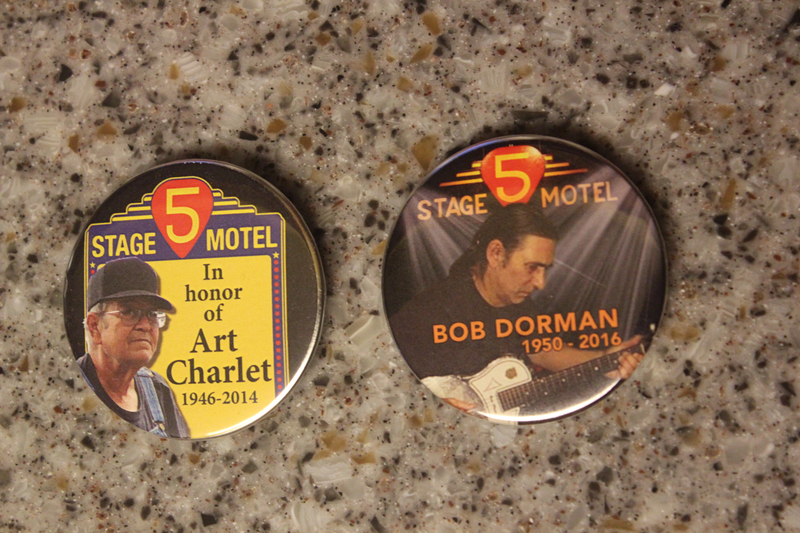 Maryanne has made lots of these buttons for our crew for many years. 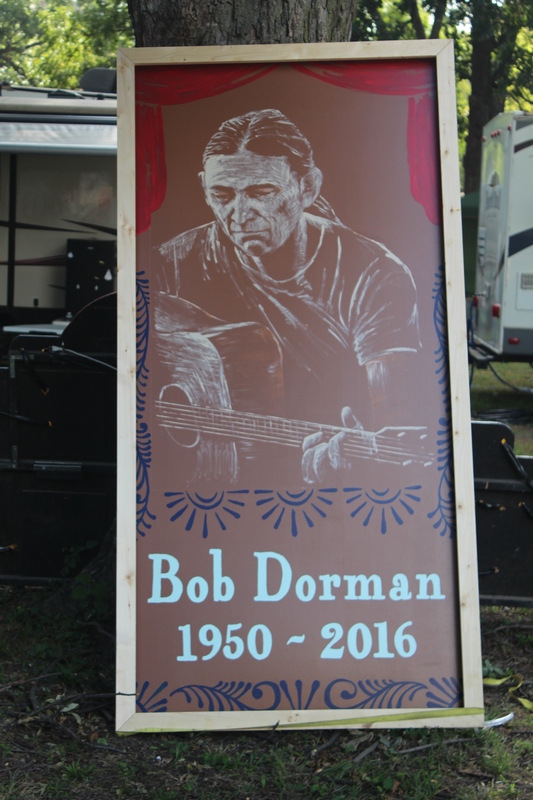 In 2016 we lost our friend and crew member Bob Dorman to cancer. 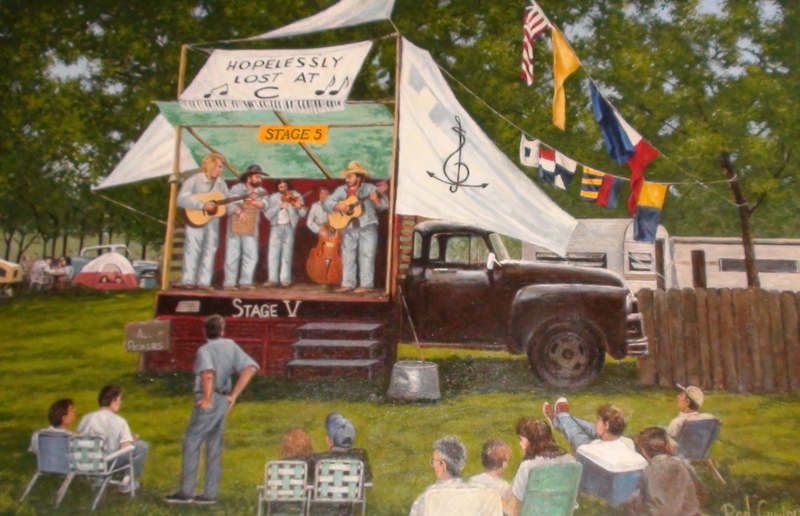 This tribute was painted by Jette Summers and given to the Stage 5 camp at the 2016 festival. 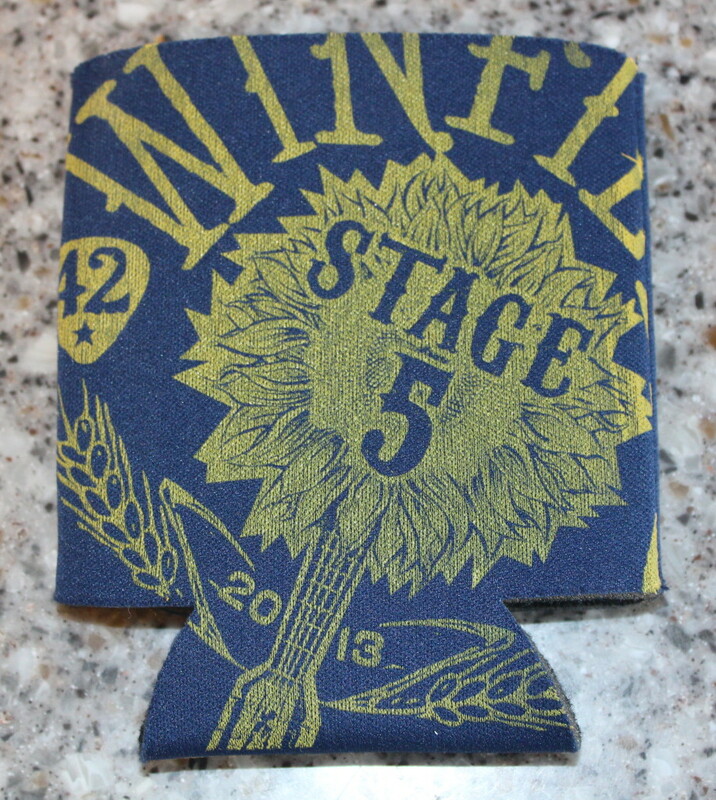 Coozies – the blue one is an Art Farm design (the festival t-shirt company) from 2013. 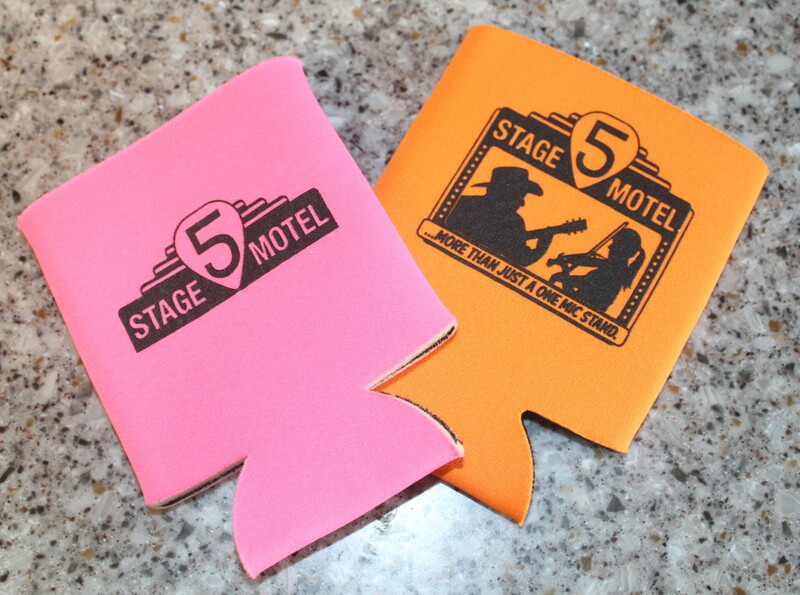 The Pink & orange (there was also green) were either 2012 or 2013. 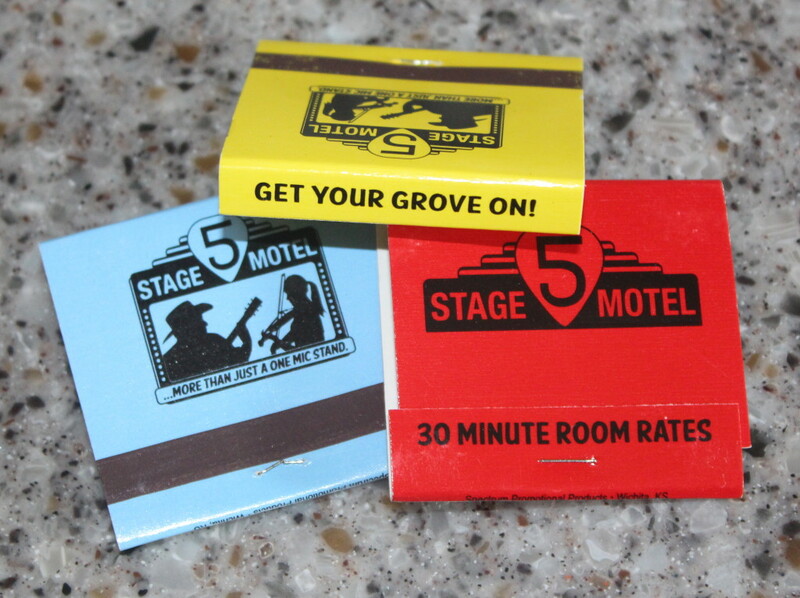 What motel would be complete with out these two items … matches and soaps. 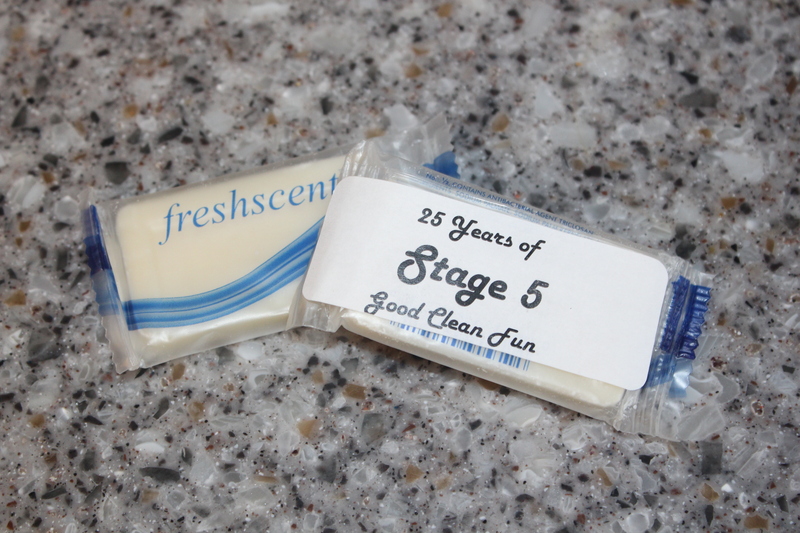 Both of these items appeared in 2011 on our 25th year celebration. Dulcie & Kirby Guinty did the matches and Bill Hoy did the soap. 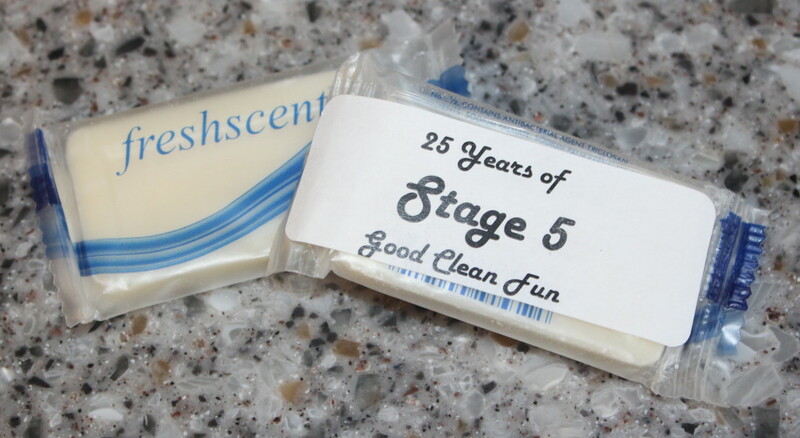 When our Stillwater Camp friends have an anniversary we like to return the favor. 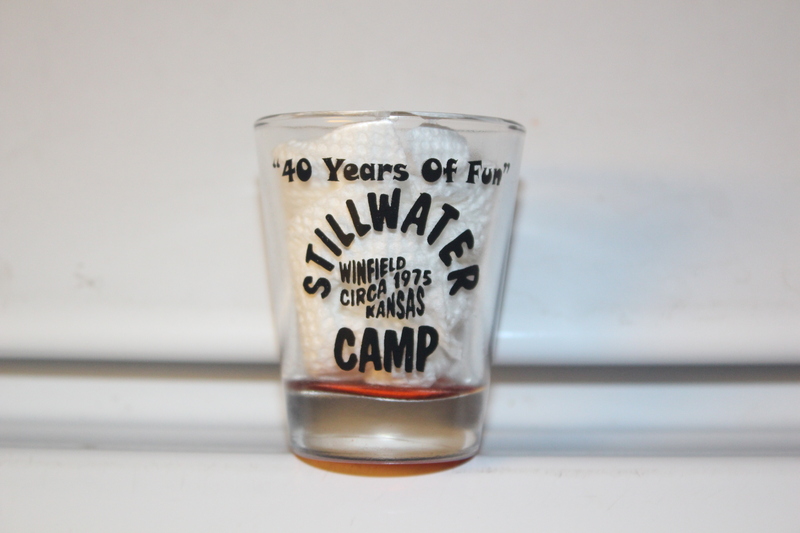 We surprised them on their 40th year with these shot glasses. 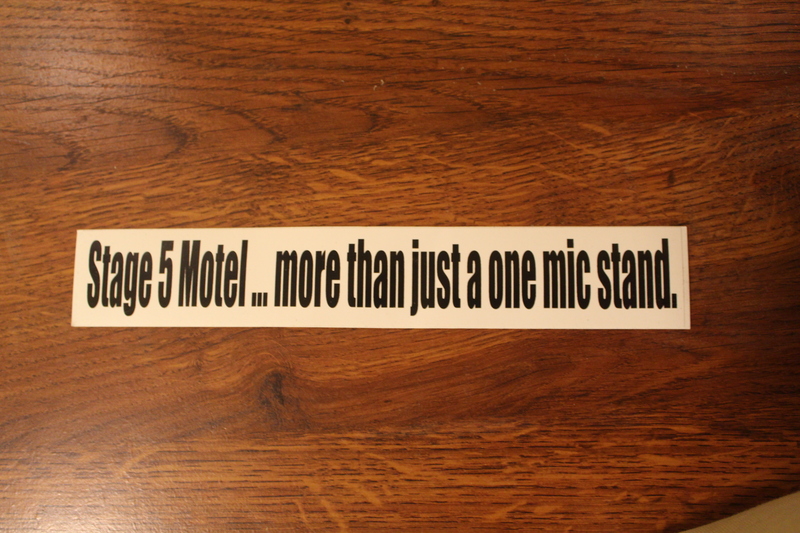 Stage 5 Motel … more than just a one mic stand. 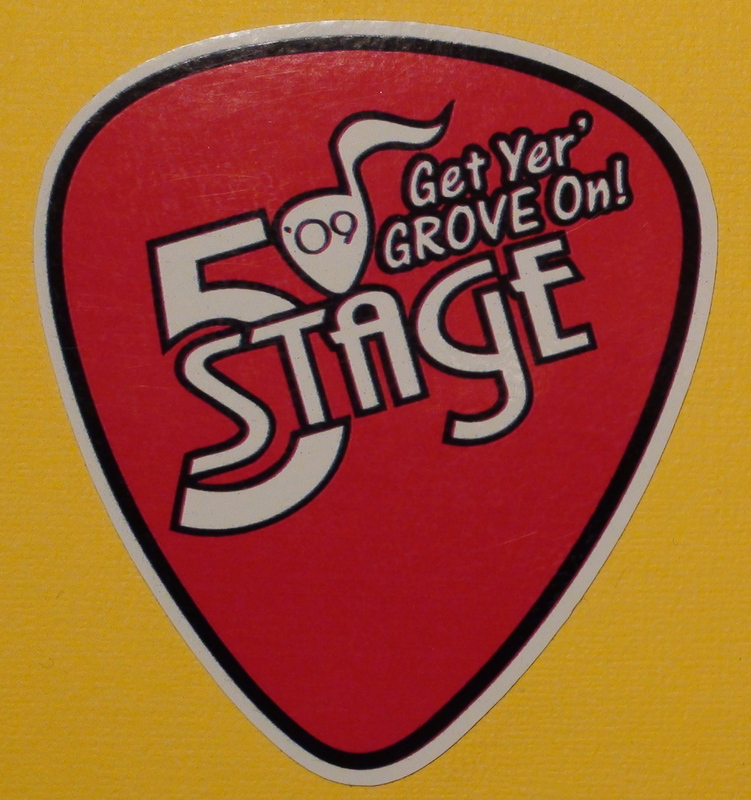 An instrument case sticker that made an appearance in 2015. 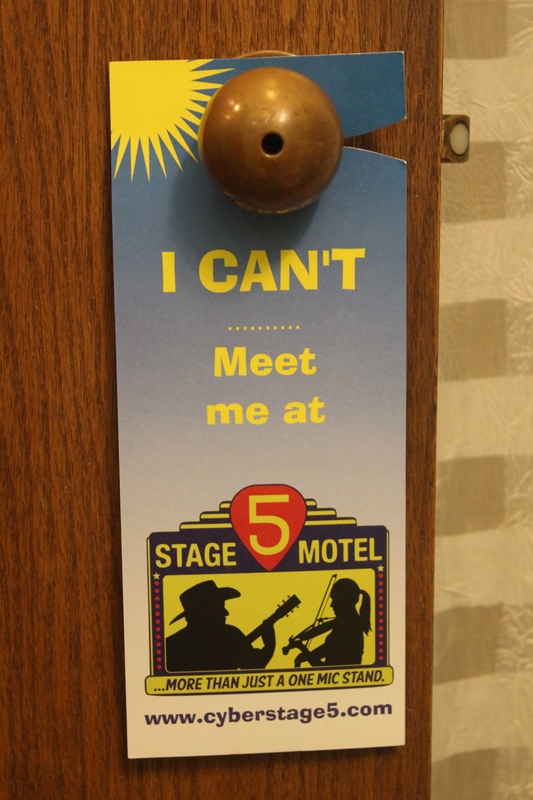 Our friends from the Stillwater Camp always come up with great ideas (and room service) to help us celebrate. 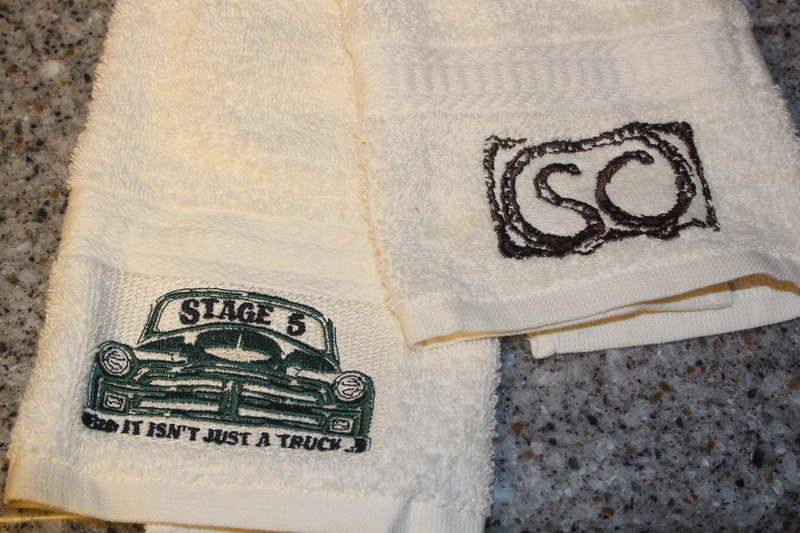 Stillwater Camp Room Service surprised us everyday .. everything from wine to soap to custom embroidered towels. Thanks Stillwater Camp .. you rock!!! 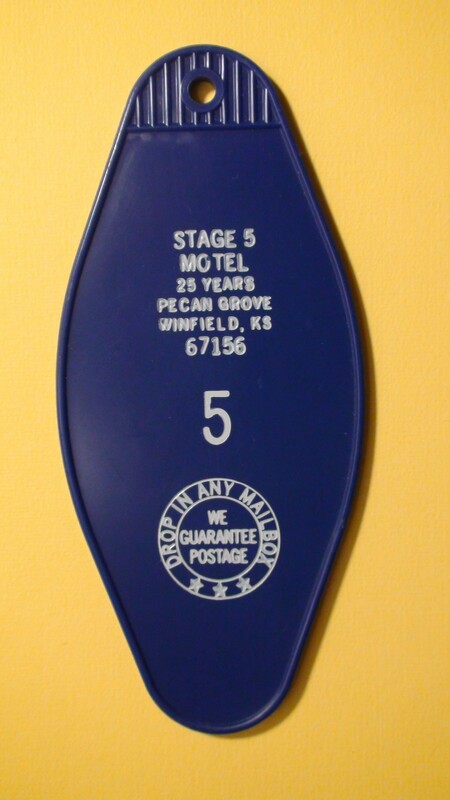 For our 30th year (2016) we also made reversible door hangers for your camper door. 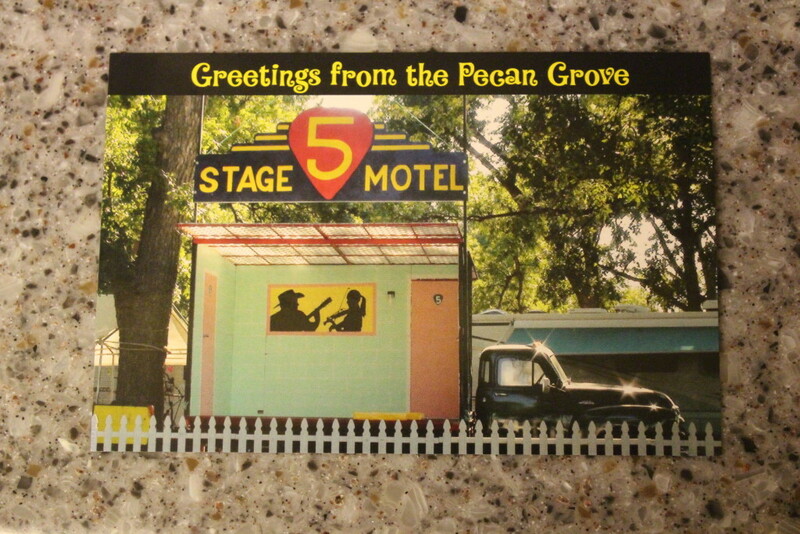 Greeting from the Pecan Grove .. yes,we made post cards for our 30th year (2016) with a picture of the Stage 5 Motel and a brief history on the stage on the back … just write your note, address it, affix a stamp and send it to your friends back home. 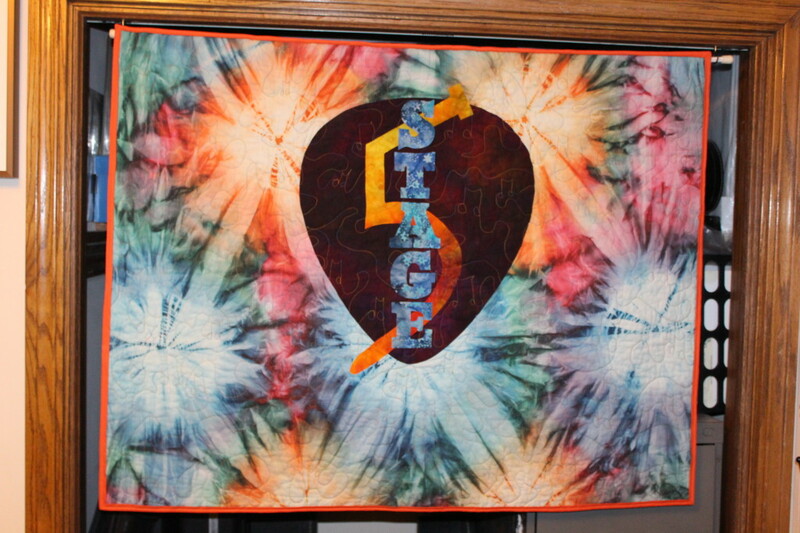 This quilted banner was hand made by our great friend Kathy Reed of Tenderfoot Art. 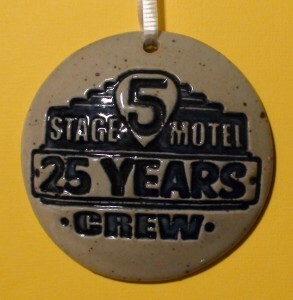 We received it in 2011. 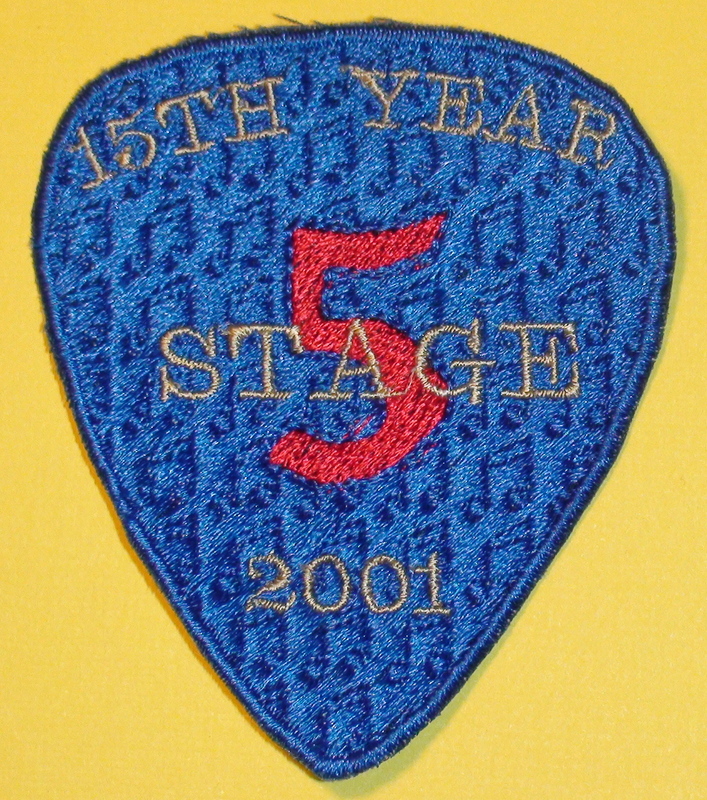 This is the  15th Anniversary Patch designed & produced by crew members Kirby & Dulcie Guinty. 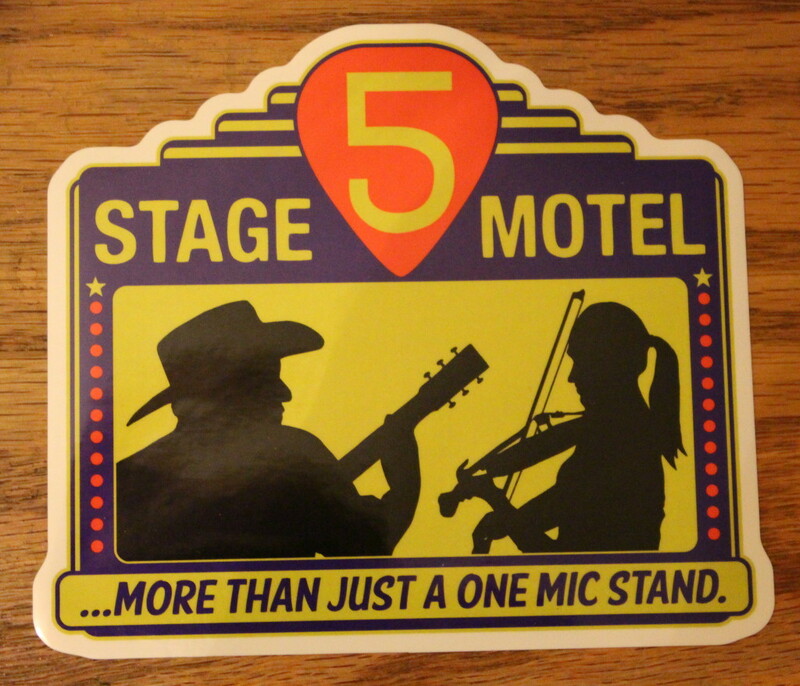 This  guitar case sticker was designed by Stage 5 crew members Craig Barber & Bill Hoy. This  photograph was taken by Walnut Valley Staff Photographer Rex Flottman. 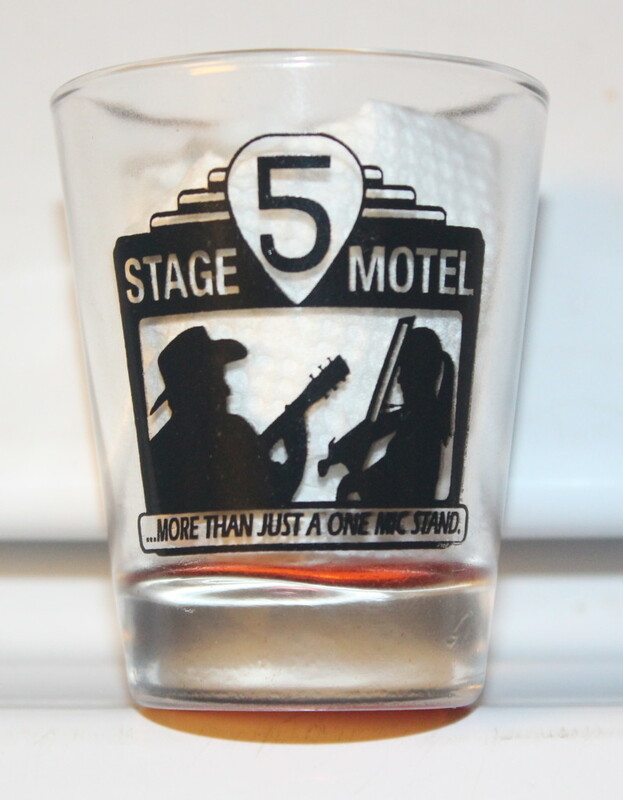 It was given to us with the stipulation that it remain in the window of Walnut Valley Festival Headquarters for 1 year. A custom made brick given to us from .. we wish we could remember from who and when. Well the mystery has been solved .. It came from Jana Dale. But neither of us can remember what year .. maybe 1998, 1999, 2000, 2001ish. Anyway we love it and it sits on a shelf in our living room. (The update happened Aug 24th 2017.) Thank you Jana!!! 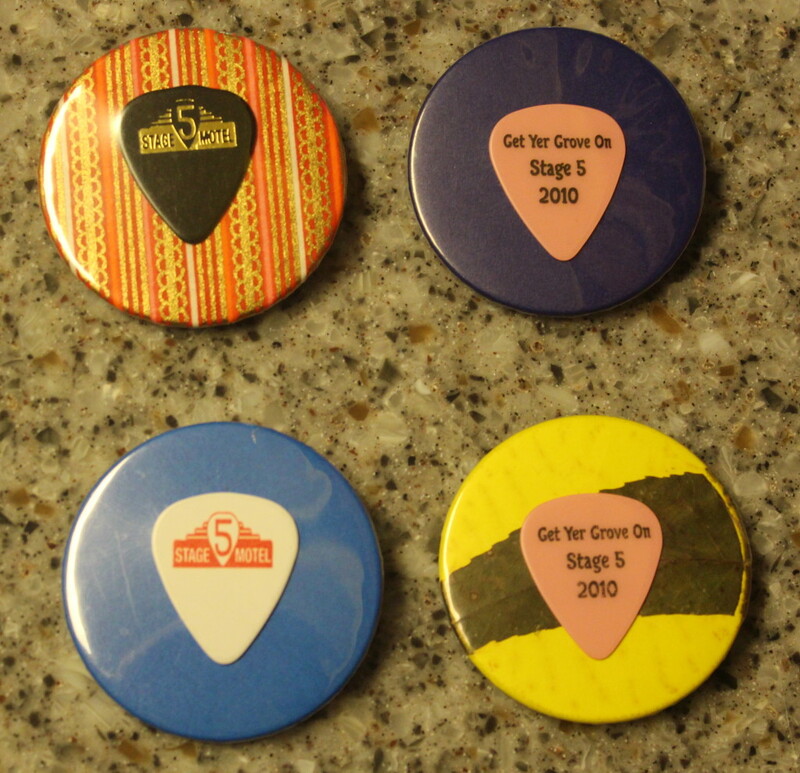 As a side note Jana has made lots of buttons for the Stage 5 crew over the years. 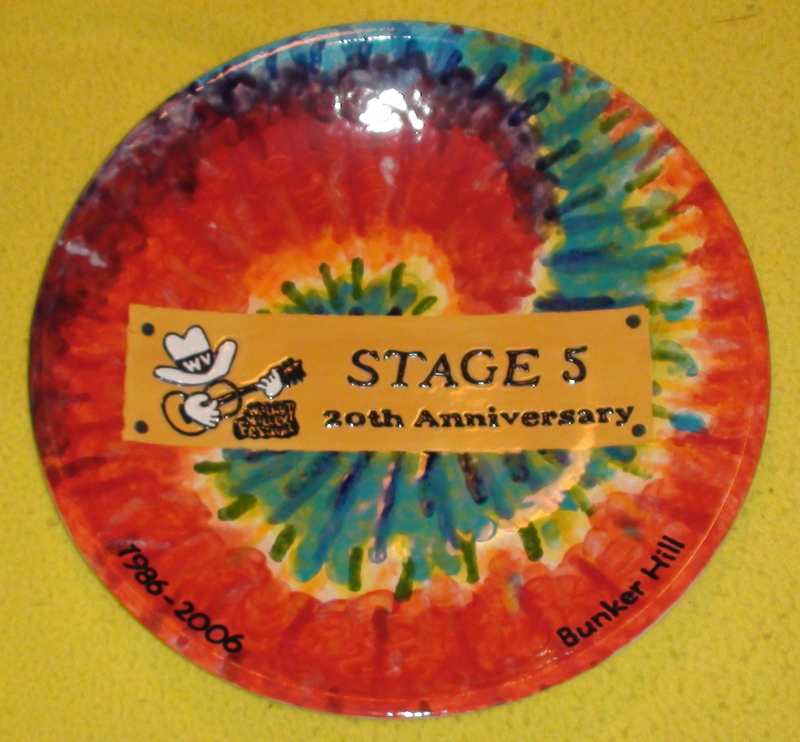 A one of a kind custom made platter presented to us from the Bunker Hill Band in the Pecan Grove on our 20th year . 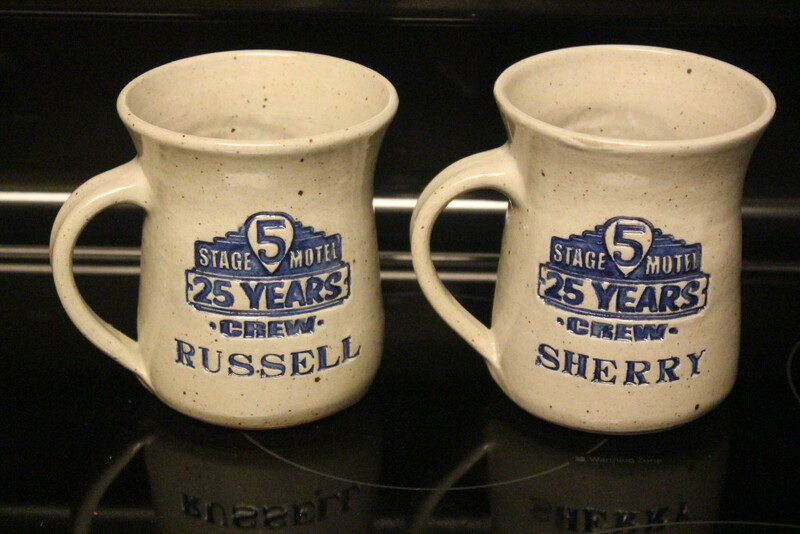 Cups for the crew on our 25th year from the Stillwater Camp special made by Elk Falls Pottery. This was the 2006 Walnut Valley Festival mug thrown by Elk Falls Pottery. 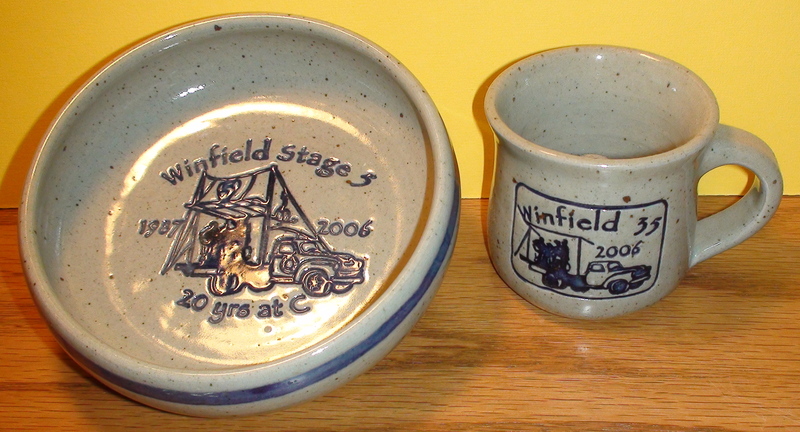 Here are two more items from the Elk Falls Pottery 2006 Walnut Valley Festival collection. 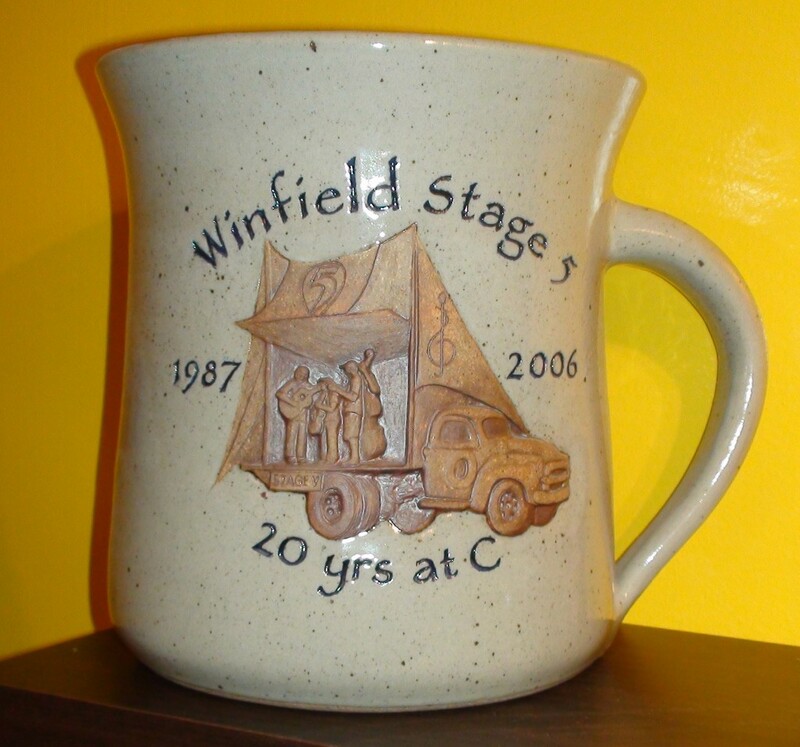 Another one of a kind, this one from the Elk Falls Pottery, this is a 1 gallon mug the was purchased and given to us by the Stillwater Camp. 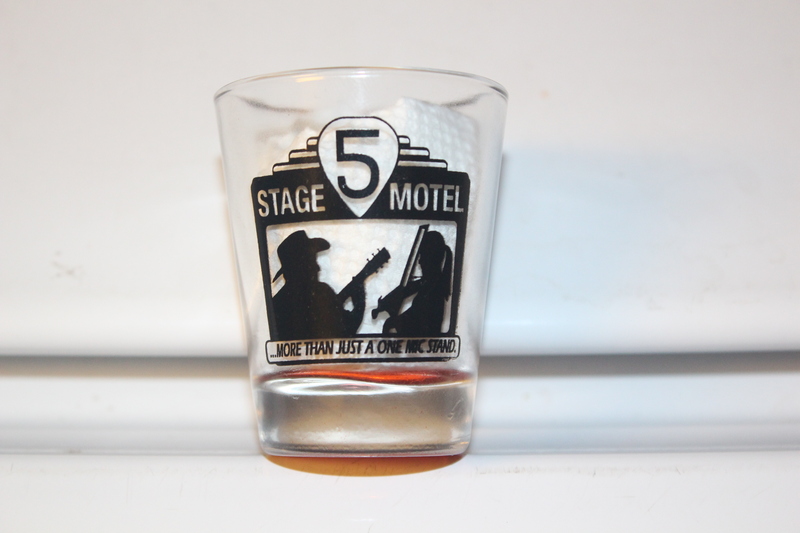 This item was a silent bid item so every time I walked by the booth I would re-bid, until one time I was told to stop bidding because I was running up the bid to high … but I wanted it. 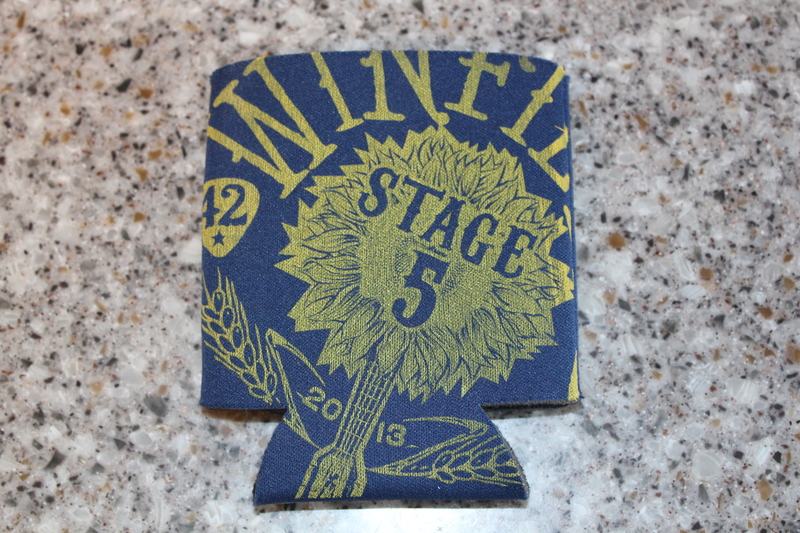 This has a treasured place in our home and the Stillwater Camp folks have be so gracious to us over the 25 years of Stage 5. We are proud to call them friends!! 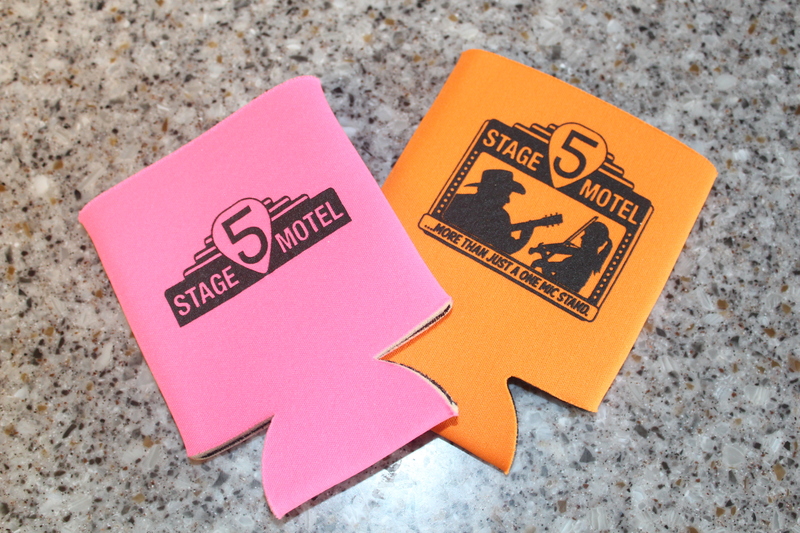 This was gifted to us by our friends at the Stillwater Camp. 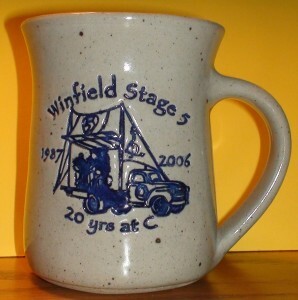 It was a silent auction item … I would bid … Stillwater Camp would bid, I would bid, Stillwater Camp would bid … I went to bid again and the potter Steve Fry told me that “I have it on good authority that you are to stop bidding.” THANKS STILLWATER CAMP!!! 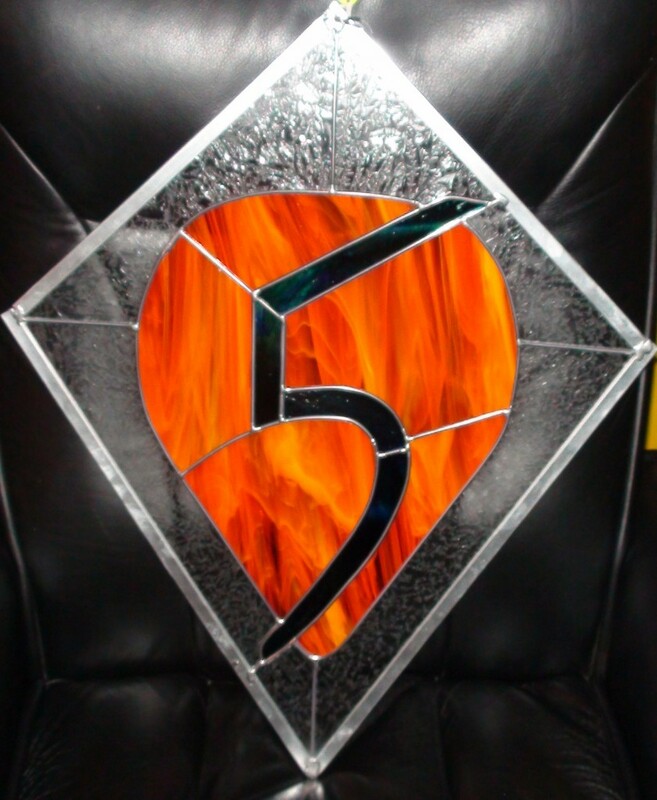 Yet another one of a kind .. this  stained glass window of the Stage 5 pick logo was a gift from the Folk Holler Band. 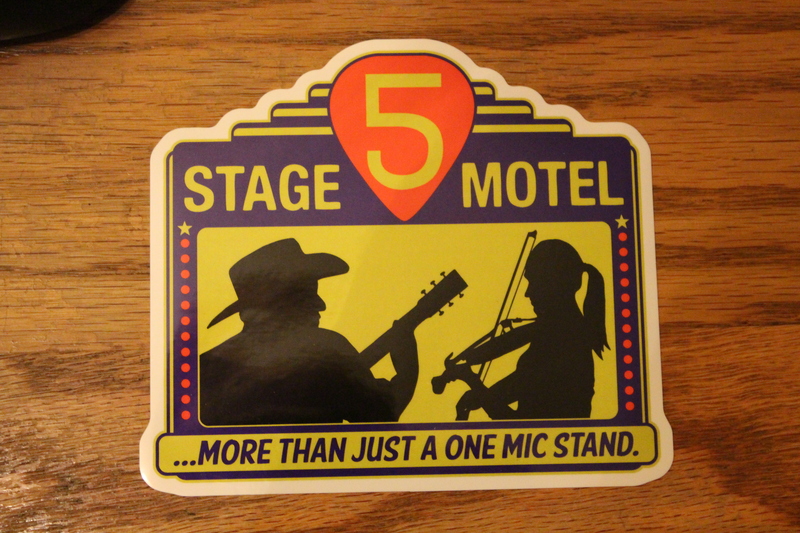 In one configuration or another the Folk Holler folks have been friends of Stage 5 from its inception and have spent many hours over the years playing music at Stage 5. We love you guys and girls!!! This is another Elk Falls Pottery item, a  Christmas ornament that was commissioned by Russell & Sherry Brace for Stage 5 crew members. A Stillwater Camp original. 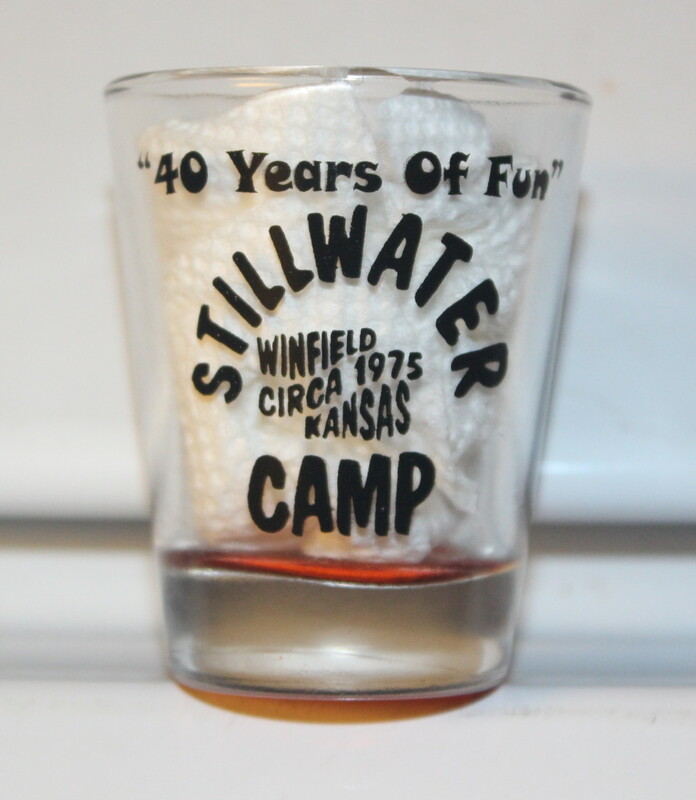 The letters of this banner are made of the purple socks that Crown Royal Whiskey comes in … that’s a lotta drinking mister … but that’s how they roll at Stillwater Camp!! 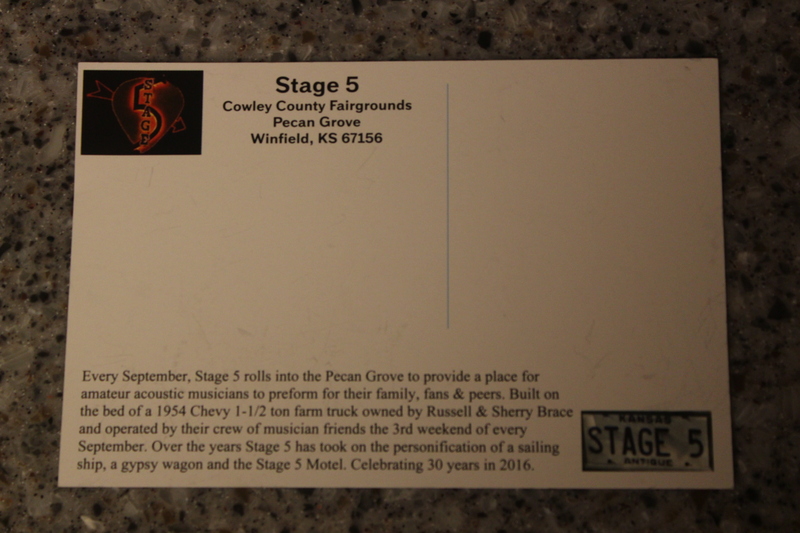 We received this at our 15th Anniversary party in the Pecan Grove. This watercolor was painted by Ron McGuinty Brother of crew member Kirby Guinty. It is of the Stage 5 Gypsy Wagon theme that made it debut in 2006. 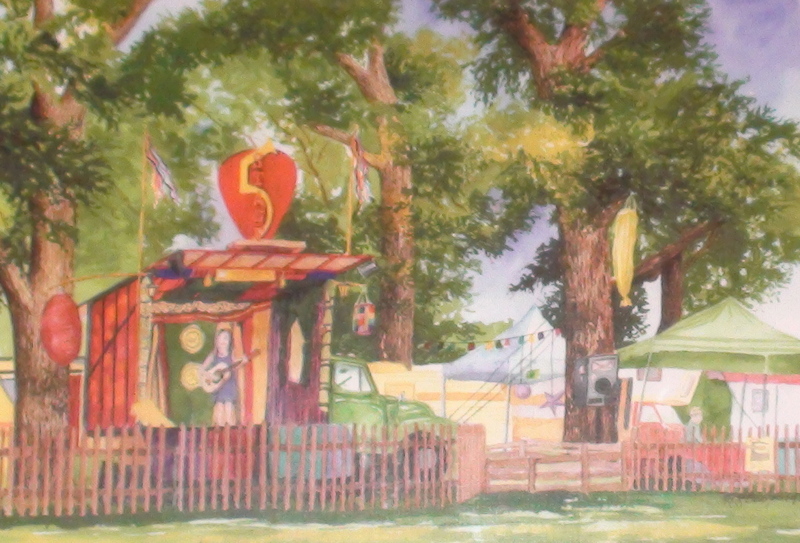 The performer on stage is Nikki Moddelmog, if you look closely under the green canopy at the picnic table is crew member Art Charlet. 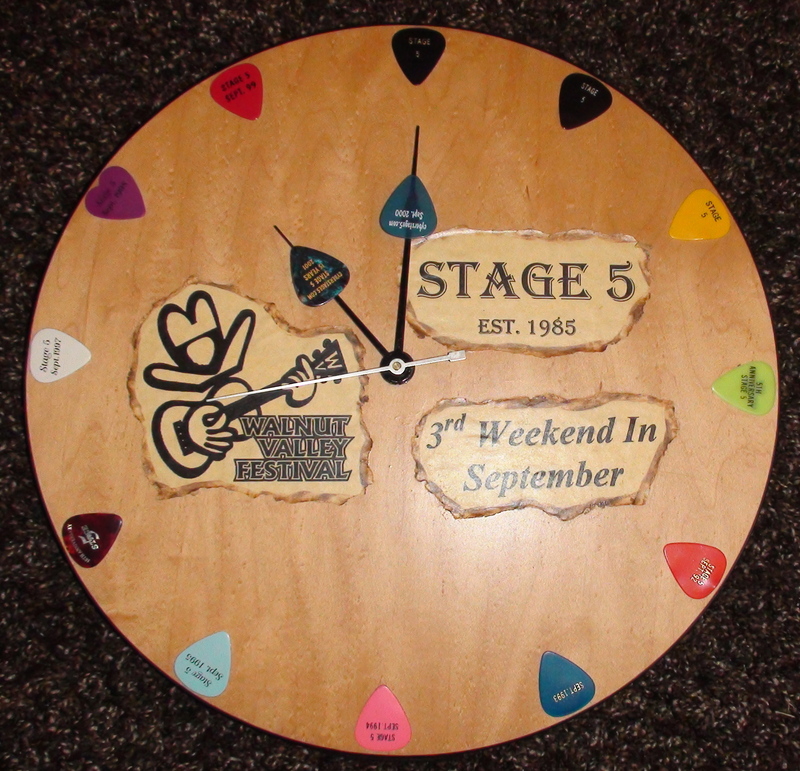 This clock was built and given to us by the Walnut Valley Voice editor Larry Junker in 2003. It is constructed on a banjo resonator that he got as the craft show people were breaking down and one of the banjo dealers didn’t want to take it home …what a deal!! 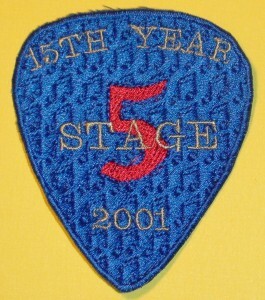 It also contains the first 14 Stage 5 picks. 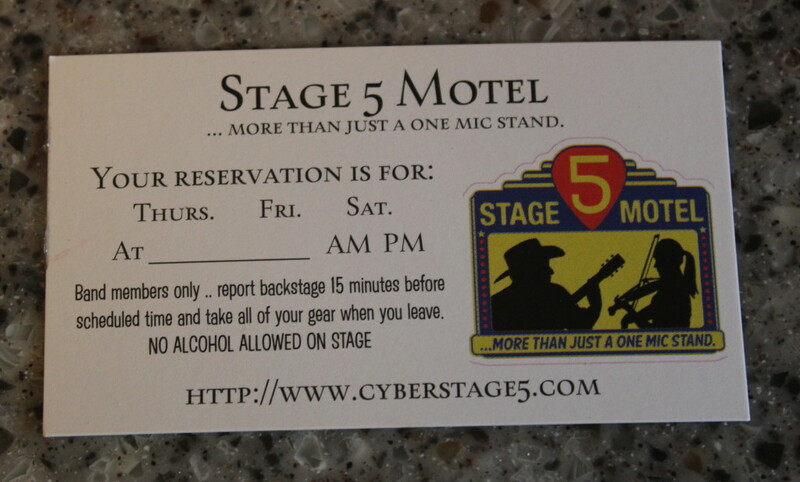 Larry is the guy that makes sure the Stage 5 Schedule is printed in “Voice” everyday of the festival … be sure to tell him thanks!!! 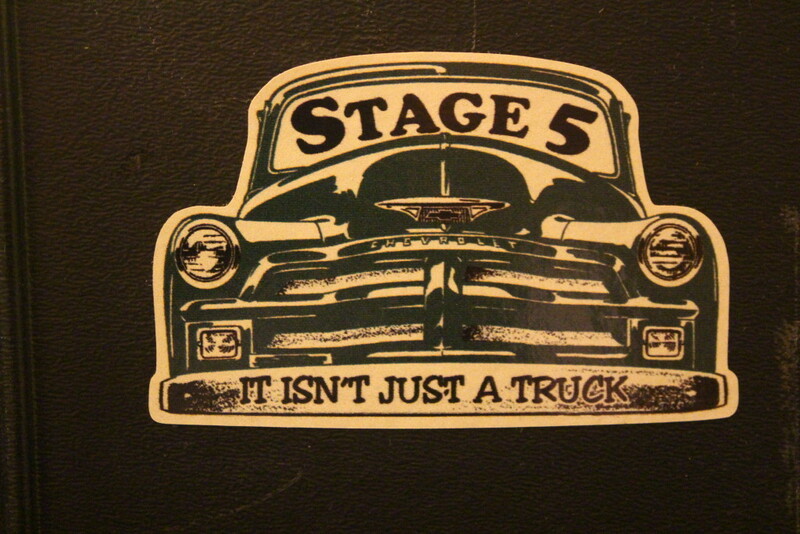 In 1999, Ron Chandler painted this image of Stage 5. 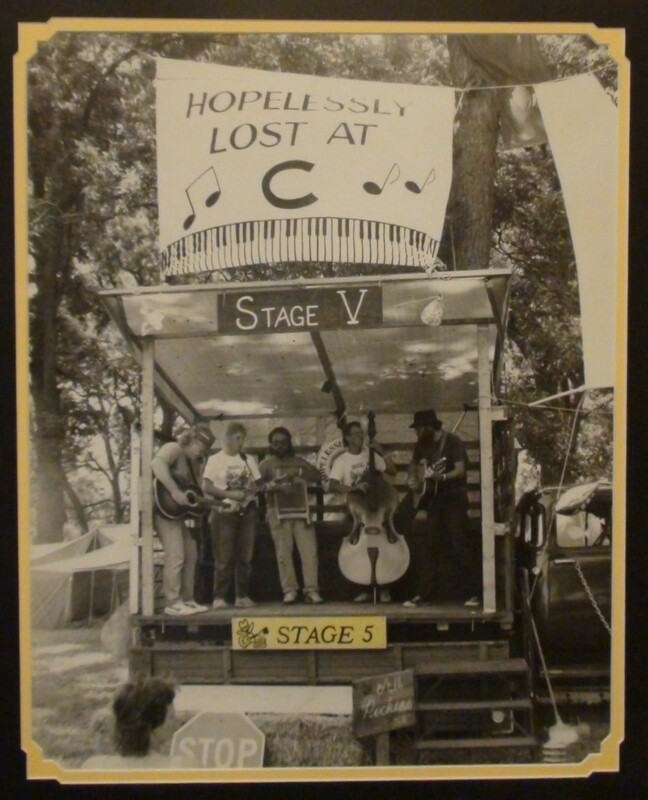 Notice that the steps are still on the front of the stage. The band playing on the stage is The Zen Okies with guest Randy Crouch [center] on fiddle. 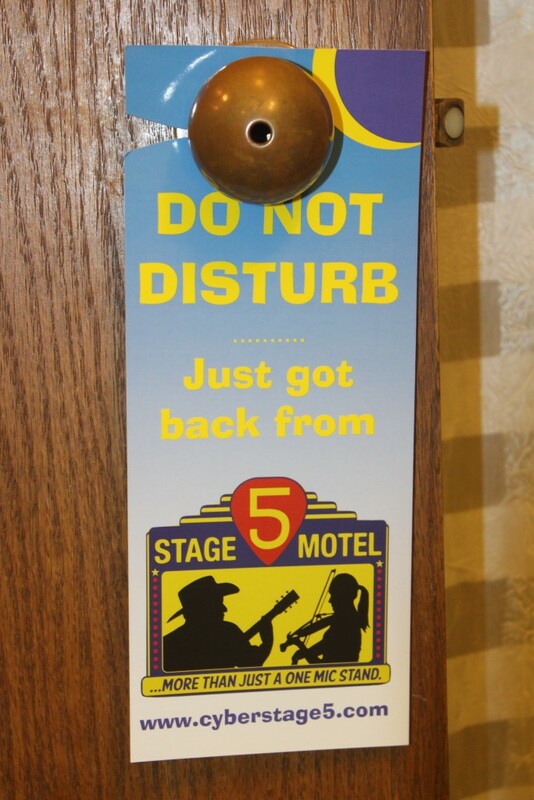 “And Here Is Your Room Key .. Enjoy Your Stay. 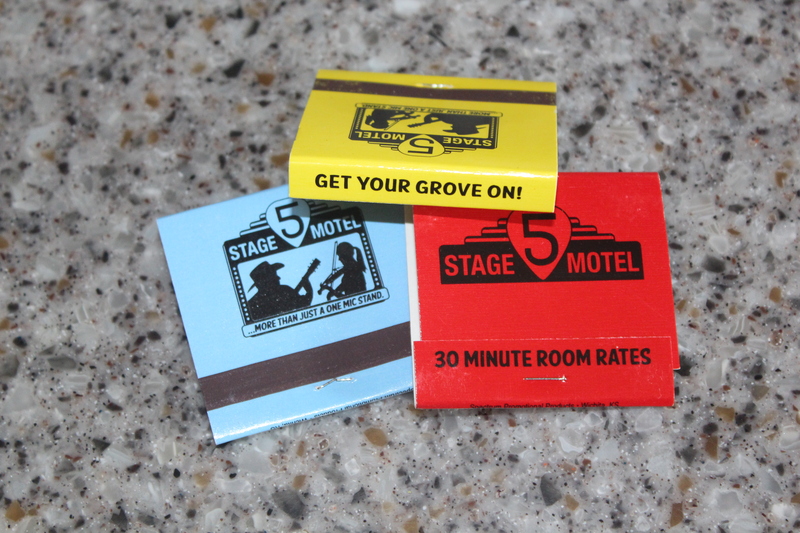 Part of the Stage 5 Motel theme for the 25th Anniversary was these motel room key tags. They were loads of fun and there are a lot of camper keys sporting room key #5. 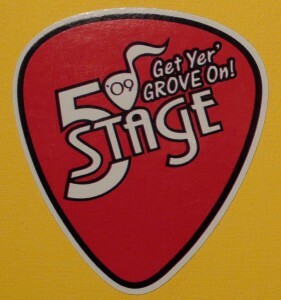 From the 2nd year of Stage 5 we have handed out guitar picks to players and fans of Stage 5. 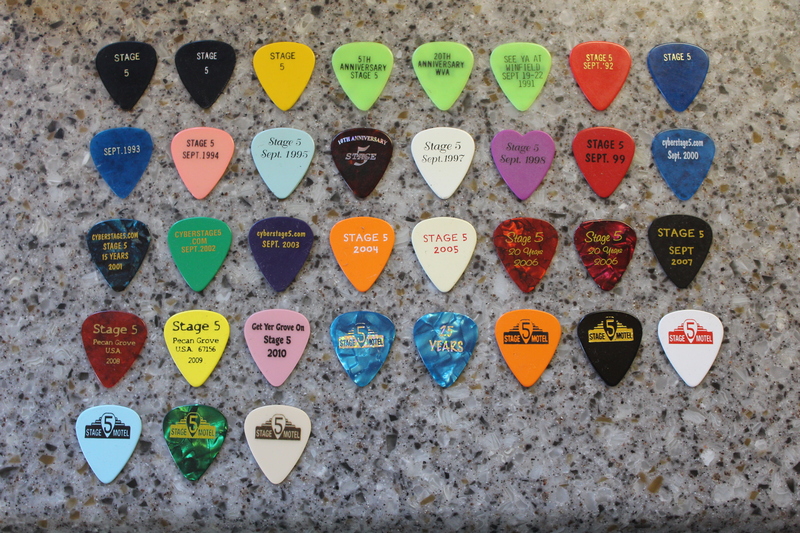 We estimate in the 31 years we have been doing this we have given away some where around 40,000 picks. Each year has a different style, look and color. 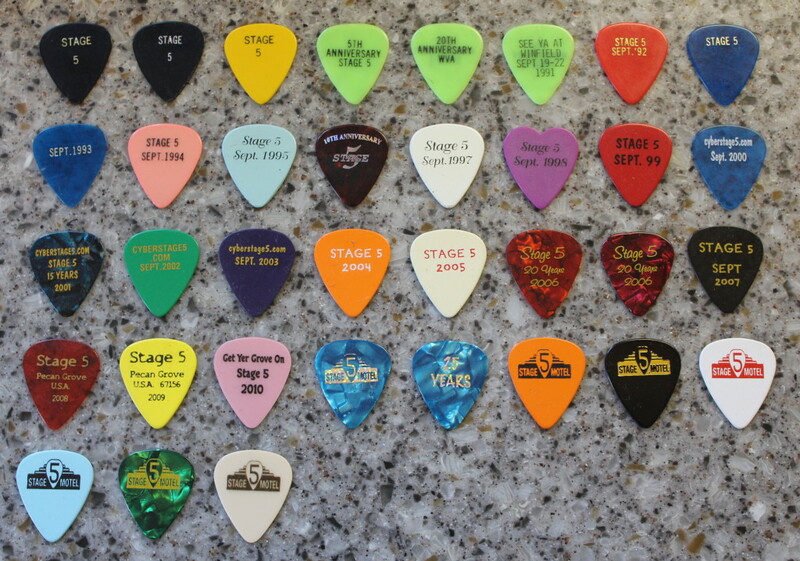 There have been special edition picks for the 5th, 10th, 15th, 20th, 25th & 30th years of Stage 5.